Copy of Certificate of Naturalization for Vincenzo Brescia, No. 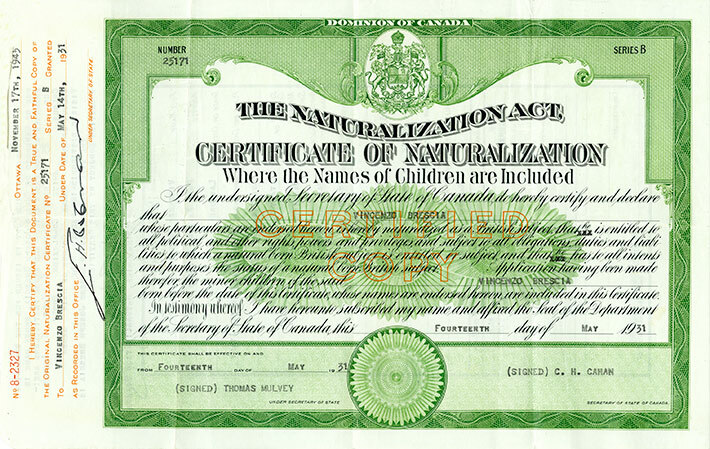 25171, Series B, dated May 14, 1931 and signed by the Secretary of State and the Undersecretary of State of Canada. This copy was issued on November 17, 1945. I the undersigned Secretary of State of Canada do hereby certify and declare that VINCENZO BRESCIA whose particulars are enclosed herein, is hereby naturalized as a British subject that he is entitled to all political and other rights, powers and privileges, and subject to all obligations, duties and liabilities to which a natural born British subject is entitled or subject and that he has to all intents and purposes the status of a natural born British subject. Application having been made therefor the minor children of the said VINCENZO BRESCIA born before the date of this Certificate whose names are endorsed hereon are included in this Certificate. In testimony whereof, I have hereinso subscribed my name and affixed the Seal of the Department of the Secretary of State of Canada this fourteenth day of May 1931. The names of Vincenzo's children Helen and Generoso (Genero Joseph) are identified on the back of the document. After the Italian declaration of war, all Italian Canadians naturalized after September 1, 1922 were declared enemy aliens. As such both Joseph Brescia and his sister Helen were declared enemy aliens after June 10, 1940. Both were required to be fingerprinted, carry a Certificate of Parole on their person at all times and report monthly to the local authorities. Despite his enemy alien status Joseph joined the Canadian military and was soon relieved from his reporting obligations.